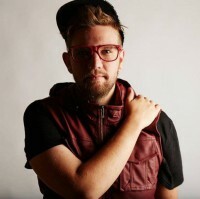 One of the most impressive breakthroughs into the upper echelons of Christian music popularity in recent times has been the rise and rise of Swedish-born singer, songwriter and record producer Jonathan Thulin. 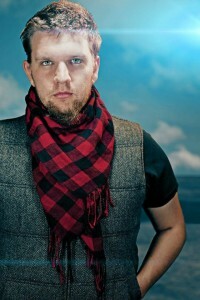 His singles "Dead Come To Life" (a duet with Australia's Charmaine) and "Architecture" both made number one on America's Christian music charts while his latest set 'Science Fiction' features guest appearances from Royal Tailor, Group 1 Crew, Kevin Max, Rapture Ruckus and several others. This multi-talented artist was born Jonathan Andreas Thulin on 7th May 1988 in Kalmar, Sweden. His parents Morgan and Helene were travelling evangelists who journeyed all over Scandinavia. According to his biography, Jonathan began singing at the age of one and made his first album with his family at age six. "Through the years [Morgan and Helene's] children Jeanette, Samuel, David and Jonathan joined the ministry with their different gifts." In 1991 the family relocated to the USA and travelling over 40 states recorded several albums including the compilation 'Thulin Family' in 2008. Jonathan began his solo career at 16, releasing his first album 'Immovable', which was a local success in his home town at the time, Minneapolis. He went on to release another album 'The Epiphany Guide' in 2008. In January, 2010, Thulin and his wife Anna moved to Los Angeles and began attending the fast-growing mega-church The Dream Center. Jonathan subsequently moved to Lake Forest and began attending a Mission Viejo church, Mount Of Olives, where he sang on the worship/praise team. By 2010 Jonathan was touring with Press Play, the pop rock band whose albums 'Life Is Beautiful' and 'NY2LA' both made the US Christian charts. In April 2011 Jonathan was signed as a solo artist to Dream Records and subsequently went on tour with Rachael Lampa, Australian artist Charmaine and Ryan Stevenson. In July 2011, Thulin travelled to Moscow, Idaho, to record his first music video "Babylon" with Neumann Films. After it released, the video brought forth major praise from the critics. Rather than the low creative standard of most Christian music videos, the "Babylon" vid was a creative tour de force. Jonathan told Kevin McNeese about the thinking behind the project. "I am a super fantasy freak. I love sci-fi, fantasy stuff, so I wanted the setting to be in a post-apocalyptic world. There's a woman who is playing the violin and she controls the whole world with her music. In the book of Revelation, it actually refers to the harlot of Babylon who is drunken with sin. It talks about how mankind has become drunk from her sin and we need to find a way out of that. I wanted to create a visual way of showing those revelations so there is this person that plays her music and everybody is controlled by her decisions. But then there's this resistance." Jonathan continued, "There's a white chapel that's in the middle of nowhere and supposedly there's this key there that can set people free from her control. These two kids are running towards this church in search of this key. When they get there, there's all these robotic looking people that we assume have gone before them there trying to find the key, but have gotten caught up with themselves, with image, with their artistry, with money or whatever it may be. So pretty much the whole premise of the video is following these kids journey inside this church. The girl that is with the boy eventually gets caught in everything going on and gets stuck, but the boy is able to escape. But maybe what everyone is after is not a physical key? Maybe that's what we're looking for. We're looking for this physical evidence of this physical way out when really it might just be a change of our mindset and understanding and looking at it in a different way." In late 2011 Dream Records released Jonathan's 'The Anatomy Of A Heartflow' album. It didn't sell particularly well but Jonathan's next album, 'The White Room', released in October 2012, was a major breakthrough. Guesting on the project was Rachael Lampa, Australia's Charmaine, who had toured with Jonathan on The Love/War Tour, and folk band Elden. Thulin teamed up with Neumann Films again and released his music video for "Bombs Away", which featured and was co-written by Rachael Lampa. The YouTube video went viral and also received a tremendous amount of support from fans and critics alike. In the summer of 2013 Jonathan's duet with Charmaine, "Dead Come To Life", reached number one on the US Christian charts. After going back into the studio to write his follow up radio single, "Architecture", and having two new remixes done by famed producer and remix artist (and brother), David Thulin, Jonathan decided to re-release his hit album, 'The White Room'. The Deluxe version of 'The White Room' produced another number one single with "Architecture". Jonathan spoke about the song, "I remember standing in Stockholm, Sweden when I wrote this. I was at one of the lowest points in my life. The sun was setting over these beautiful buildings and I thought to myself 'someone built these buildings hundreds of years ago and they are still standing today' and I realised then that God wouldn't give me more than I could handle and he created us to be legend makers. Every decision we make, every seed we plant and everything we build will last far after we leave this earth. I knew I would get through because God didn't build me to fail." Now Jonathan's 'Science Fiction' album has been released. He said, "The album was different for me. I didn't strategically write songs as I usually would, I just wrote what I felt in complete honesty. My hope is that this music will transcend beyond people's ears and into their hearts. God is a big part of who I am and all I want is for that to shine through my music."